The Geoconcept Geolocate mobile application enables field professionals to geocode fixed sites directly on the ground, providing even more detailed and accurate analyses. To improve mobile resource efficiency and company performance, Geoconcept Geolocate enables mobile teams to geolocate an address, a locality, an object/building (hydrant, forest landmark...) directly on the ground from a smartphone or tablet. At the desired moment, the application assigns x, y coordinates from the field using a GPS source, with no need for an Internet connection. The coordinates are then captured before being recorded in the application. With Geoconcept Geolocate, sales personnel, technicians, delivery staff but also firefighters or military personnel can easily capture the exact address of a customer, sales/delivery outlet, callout location and update their information. They capture the x, y coordinates from their mobile terminal and update them or create new data in their reference table. The data geolocated in this way can then be exported by means of a CSV file. In addition to the features already existing in its free offering, GEOCONCEPT is offering a Premium version of Geoconcept Geolocate. This version enables the user to access a comprehensive web solution for managing this database: in addition to geocoding tools and for navigating everywhere on a map, the mobile teams' itineraries can be optimised and geo-marketing features provided. The capture of an unlimited number of data items (import/export limited to 30 contacts for the free version). 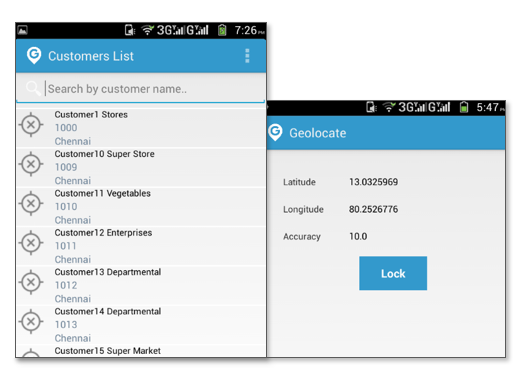 The Geoconcept Geolocate application is available on Google Play.